Texas Wing just couldn't follow the newish Encampment rules. So after a couple of warnings they got wacked. Didn't help that they posted videos on the internet showing them violating the rules. 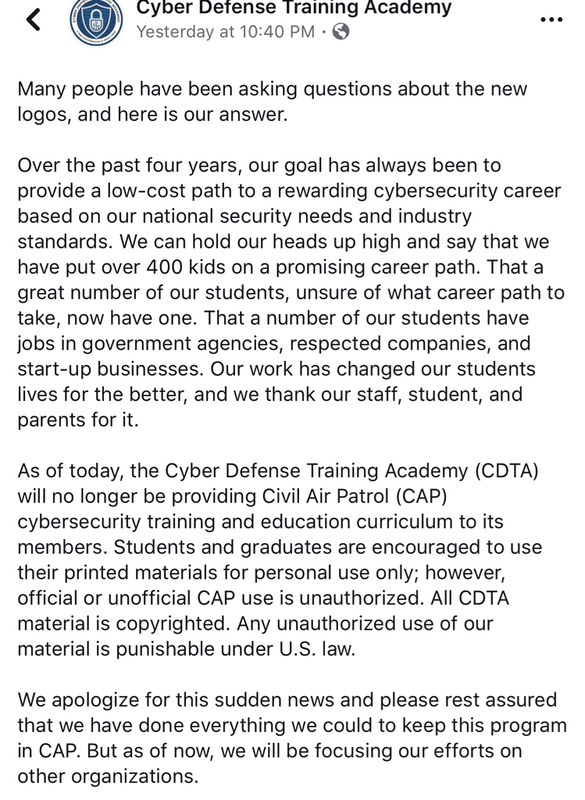 It'd be nice if the CAP cyber curriculum and the CyberPatriot competition were in line to at least some degree. CDTA made it very clear they were not training the cadets for the competition. If we're going to push CyberPatriot let's train our cadet to at least be competitive. Like I said before, right now you're only as good as the guy (or gal) teaching you at your local squadron meetings. We start the year with about 3/4 of the cadets from last year and replace those we lost with 1/4 new cadets. The 3/4 that remain then sit through the same power point slides from last year to teach the new cadets. In that 2-3 month process we loose about 1/2 of the cadets from the previous year because they get bored to death from watching the same power point from last year while sitting there thinking they could be at home doing their homework. The cadets never really move forward with their training and therefore never really move forward in the competition. In years past the cadets were told to go the CDTA over the summer so they'd get advanced training they could bring back to the squadron to help with the competition only to find out that CDTA has nothing to do with the competition. Goes right back to some of the other recent topics on Encampment. That's why you follow the regulations, and when you have a 'chance to improve,' make the improvement; don't waste the opportunity. We've faced some of the same issues. You ask a room of 20 people, "Who wants to get involved in CyberPatriot?" 3/4 of the hands go up. You start to organize it, and then the numbers dwindle fast. We used to have a team that met at a cadet's house each week, but even the numbers there stopped showing up (it was really the parent that was interested). We've done some presentations on it, and some practical exercises, but nobody has really shown an interest in long-term activity participation. Now, some cadets in CAP absolutely love it. I think it's a great program. There are units that are very heavily involved. It just hasn't been received as much at the home squadron. to get to a comfort level. Something our beloved kids these days don't have much of. you can't do the latter without also doing the former. Get ready to "Hack the Gibson!" 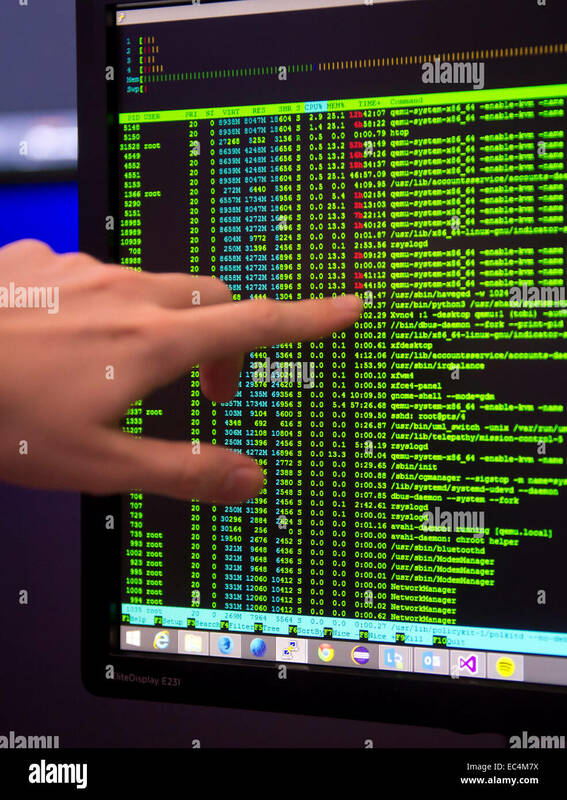 ...looking to find some 12-year old running a script from his Aunt's basement trying to hack V-Bucks. assumed by AI. There will always be people minding the store, but in 10 years? It'll all be AI doing the security. support increasingly "rip and replace". It's not there yet, but I'm glad I'm nearing the twilight of my career vs the mid-point. It'll all be back-room soon, with again, AI doing the bulk of the heavy lifting. Meanwhile, I'm looking on eBay and similar sites for a classic VT-series dumb terminal. What rules did they violate? Right there with you. Looking for my "end of tour assignment" that will get me to retirement with most of my brain cells and all of my hair intact. But I too have witnessed the move from VT-100/3270 terms to PCs w/emulators on Big Iron, then PC "client server" apps, where the PC was doing your lifting, which morphed into server-based terminal apps on "big servers," then back to Big-ish Iron with virtualization, then cloud... "it goes big, it goes small, it goes big.." I'm getting ... tired. Relevant to thread: so, my middle son (who enjoyed the Maryland cyber NCSA last year) instead spent the summer as a research intern at GA Tech working on aircraft data links. I wondered if he'd want to go to the advanced cyber NCSA, but instead he took the shot at breaking into a different area (Ahem, it also was paid, ahem!). BTW, Eclipse, I've been in command centers and SILs that do look like your fancy picture. Sadly, most of them are CONUS and near the money (for visibility... notice the three "money" guys on your catwalk in the pic!). Few of them are used by operators. The CAOCs that I've been in are some of the nastiest coffee-and-spoiled-fast food compartments I've ever worked in. They look less like "Enders Game", and more like a cross between "1980s Crystal Peak" (Terminator) and a battered Conax container. Still better than working in a server farm. Hey, the server farm at least has working air conditioning!